New York, NY, August 10th, 2011 (TOPGUN PRESS) – When Bank of America’s acquisition of Merrill Lynch closed in the beginning of 2009, clients were skeptical of the new combined entity. According to corporate clients, it was having an identity crisis and the internal issues came through to clients in terms of Bank of America’s contact with them. The brand was tarnished due to the adverse publicity around the merger and clients were concerned about the loss of people, disruption of coverage and about getting lost in the shuffle. 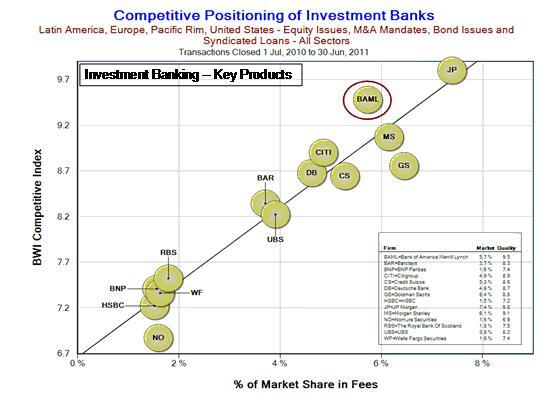 Now that the dust has settled, corporate clients rate the combined Bank of America Merrill Lynch banking brand as top three in the world (up from ninth at the end of 2008), have it positioned to grow market share and the equity research and sales teams both rate highly with institutional clients. Bank of America’s position is rapidly rivaling industry leaders JP Morgan, Morgan Stanley and Goldman Sachs and leaving behind firms like Credit Suisse, Citigroup, Deutsche Bank, UBS and Barclays. Investors in the stock however, do not share the same sentiment. Investors still rate their confidence in Bank of America below average in the banking space; well below that of shareholder confidence leaders like JP Morgan and Goldman Sachs, whose investor and client views are aligned and who have weathered the recent bank selloff better than most.